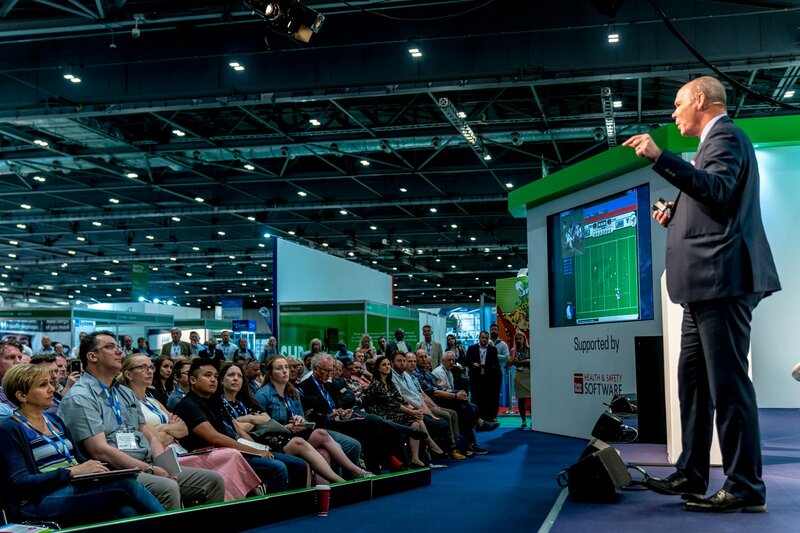 Data and technology helped England win the Rugby World Cup, Sir Clive Woodward told a packed keynote arena at Safety & Health Expo. 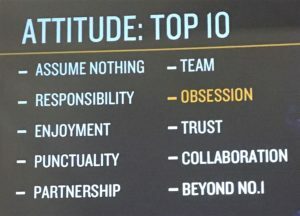 Sir Clive, who spent 16 years in the corporate world before coaching the national side to World Cup victory in 2003, compared the ‘host of common traits’ which work across both sport and business. 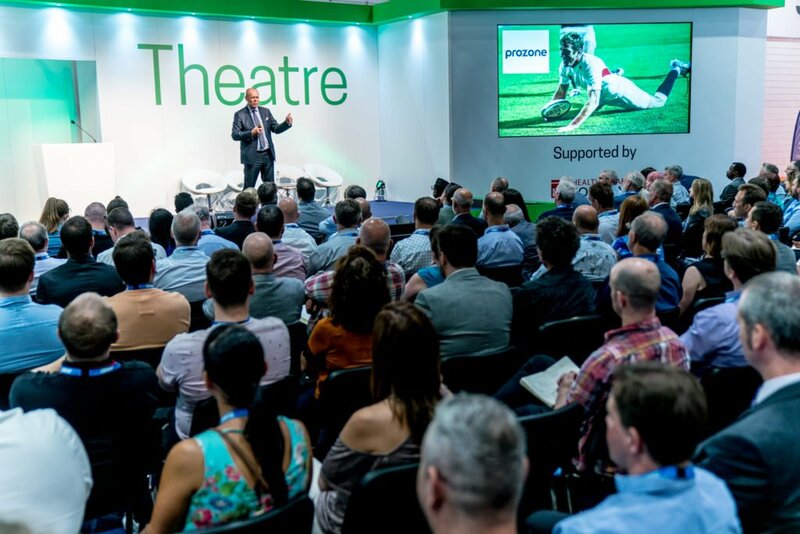 Focussing on how technology can give you a significant advantage, he described the moment he went to see then Arsenal football manager Arsene Wenger, who showed him the revolutionary sports data product, Prozone which he was using to analyse his players’ performance. Players’ data was captured using an array of cameras fitted at height around Highbury stadium. As a big Chelsea fan, Sir Clive wasn’t initially enthralled with the idea of a day at Highbury, but then “I’m a sponge”, he said. He described the day with Wenger as one of the best and most important days of his life – a “jaw dropping moment” – and immediately persuaded the board at Twickenham to buy the product. Embracing cutting-edge technology, in this instance, allowed him to see the game in a totally different way. He was able to gather data on the players that showed him who was running the furthest and the fastest, who was not doing their job properly, who was in the wrong position. The data meant there was nowhere for the players to hide. Unsurprisingly, this was met with initial silence and dismay with his team. But having access to this technology and data took away the mystique and the myth from ‘more talented’ opponents England faced, as they merely became dots on a page – just data. Sir Clive also gave each player a laptop so they could analyse their own player data, recalling how at the time only around 5% of the squad could actually use them! – How had they played? – How had England played? – How had their opposite number played? – How had the opposite team played? 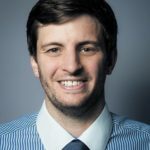 “Martin Johnson became an amazing leader because he was able to leverage his talent by becoming immersed in IT. The IT world is not going away, it’s the biggest way to leverage your talent and succeed,” said Sir Clive. “Whoever wins in IT tends to win,” he said. Working in an individual’s performance is key to a successful team, Sir Clive said. “The secret to understanding teamwork is about getting every individual to a stage where they are working at their optimum,” he said. “Great teams are made of great individuals”. Sir Clive said he had spent huge amounts of time during his career working with individuals to get the best out of them – and consequently the team. Something that could apply to any industry. 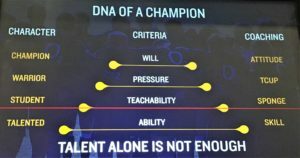 He went on to describe his winning coaching formula known as the DNA of a Champion, outlining the four characters of people within a team or organisation that made up that DNA: Talented, Student, Warrior, Champion. Talent is key, but talent alone is not enough. Recalling the time when he first took over as England rugby coach. He focused on competitors, pointing out how there were teams with more talent than his, and reeling off the inauspicious record England had against the likes of the New Zealand ‘All Blacks’, the Australian ‘Wallabies’, the South African ‘Springboks’ and the Scots, “well, maybe not the Scots”, he joked. How do you gain that edge over those more talented rivals, how do you leverage the talent of your team or workforce. Sir Clive remarked that whilst you can’t make people what they are not, you can coach talent into people. You need the ability to learn; act as a sponge never a ‘rock’. If people are going to succeed, they need to a have a sponge between their ears, have a passion for their subject and a real passion for learning. He did point out that it was important to qualify your data with your ‘students’ first, recalling an away match (Prozone was only recording data at England’s home ground Twikenham) when Will Greenwood was repeatedly making sprint shuttle-runs during breaks in play to ‘improve his Prozone stats’. Sir Clive’s next tip was to imagine writing a book about what you are doing in your job. The most important page being the contents, how would you break down what you do within your job? WHY – Distil – Identity keys to success. What are the key points as to why we’re successful and how can this message be portrayed in simple language. HOW – Do – Leverage ‘keys’ through deliberate practice/training. Is what we are doing linked to the key points? How we practise it and make it better. The importance of having staff who know how to act under pressure to act, both in sport and in health & safety. Sir Clive went through a series of ‘TCUP’ (Thinking Correctly Under Pressure) moments from his career and spoke how vital it was that his players were prepared for how to deal with each of those situations. He spoke about how having spent time with the Marines taught him to cover all bases before hand and you are more able to cope in pressurised situations. He als0 spoke of his love of meetings, “Meetings are great, you can’t operate without meeting”. During team meetings, he would creating scenarios using a clock, a scoreboard and a whiteboard and would pick out players and ask would they would do in these scenarios. This is a strategy, said Sir Clive, which could easily be replicated in the world of health & safety and disaster management. And when it comes to attitude, Sir Clive always starts with punctuality …. “I’m never late!” he said. Sir Clive Woodward: how technology helped England win the Rugby World Cup Data and technology helped England win the Rugby World Cup,says Sir Clive Woodward. Whats Clive Woodward got to do with Health and Safety another expert on nothing ?